Katana:Mumei Aoe #35 Jyuyo Token. Signature :Mumei Aoe #35 Jyuyo Token. This sword belongs to Saijyo saki ranking. Sayagaki was done by National human treasure. Honami Nissyu. Blade length :75.0 cm or 29.5 inches. Sori :2.2cm or 0.86 inches. Width at the hamachi : 2.92cm or 1.14inches. Kasane : 0.57cm or 0.22 inches. Era : middle Kamakura period Syoan era 1299. 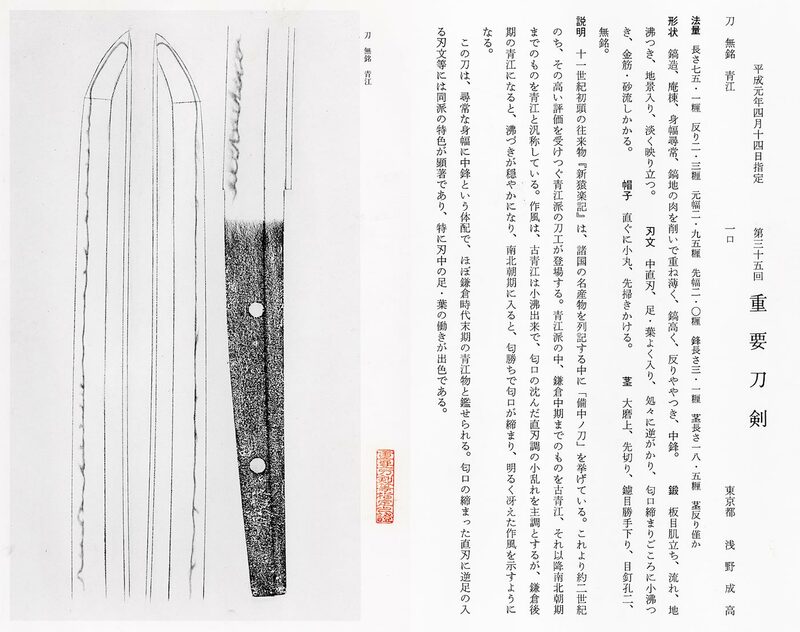 Shape : The blade is oo suriasge mumei attributed as Aoe. the blade is long and wide and thick with deep sori and longer kissaki nice looking shape. Jigane :Itame had hadatachi mokume had,and chikei work and also chikei work. with Yo,asi work with soft feeling nioikuch like mooring mist which is very soft nice feeling. 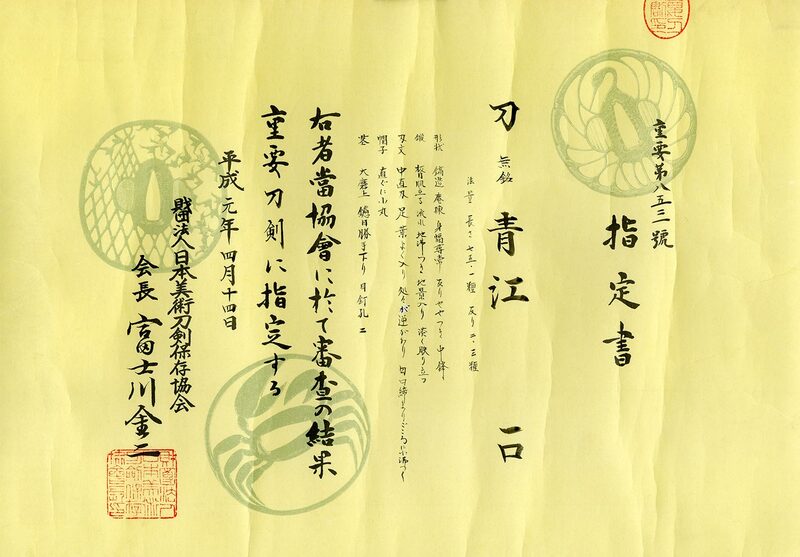 in late Kamakura period to early Nambokucho period. Hamon has nice Choji Midare. Saya :Gold Nashiji plate, family crests are painted by Erushi. 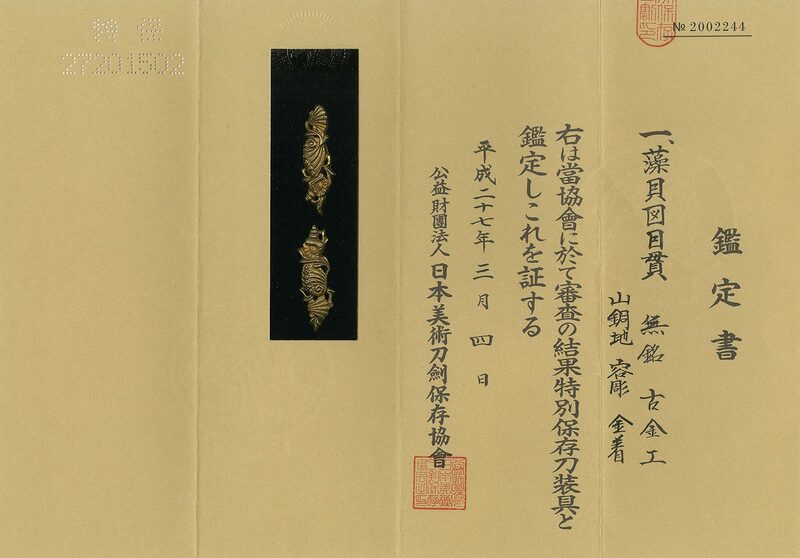 Tsuba :On the syakudo plate, plant and family crest are engraved with gold color.